As another school year comes to a close, I’m reminded of the sleepless nights cramming for finals and surviving the day in a blur. I could see light at the end of the tunnel, and it included a bed with countless uninterrupted hours of sleep. I knew if I could just make it to the end of the tunnel, I would be okay. When I was in high school, I remember one final’s week in particular. Our senior scrapbooks were due, and they were counted as the final. I had been saving things throughout the year, but I hadn’t made any attempt at creating a cutesy book with everything placed and labeled perfectly. My boyfriend (husband now) had even less done than I did. I brought everything I could think of over to his house, and we worked for hours every night on our books. By the end, we both had something presentable, but I was certainly not satisfied with what I turned in. I was too tired to make it look good. Luckily, I was exempt from final exams, so the fact that my last days of school were spent sitting in class doing everything in my power to stay awake didn’t affect my grade. In college, finals week was nothing short of torture. It never failed that someone needed help figuring out a math problem, or they needed extra eyes to proofread and edit a final composition, or maybe they had a project and just needed an extra set of hands for a few minutes. It was hard for me to say no in those situations because I knew I would want someone to help me if I needed it. I would help someone out and get back to my own studying. With flash cards in hand, a group of us would head over to the library and search for a conference room to claim. We studied until the library closed somewhere around 1:00 AM. A couple of us would go from there to camp out in the only other place opened on campus – a cold room full of vending machines and a few uncomfortable plastic booths. I’m not certain how I was able to take (and pass) finals during college. I survived on the cappuccino vending machine in the lobby of the library. We didn’t have energy drinks then, but I have a good feeling you wouldn’t have seen me without one. In my head, there was never enough time. I didn’t have time to sleep, and I didn’t have time for friends. I don’t know how I found time to shower, but I did. . . . Well, at least I think I did. Don’t wait until the last minute. From the first day of school you know when finals will be, so if you have a major paper or project to do, start it early and work on it a little here and there. Don’t cram! I should have listened to this advice myself. Staying up all night will not help you do better on your test. In fact, you might even do worse because of lack of sleep. 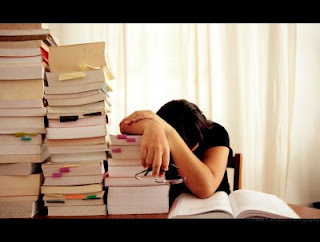 Instead, set a time to stop studying, get a good night’s sleep and glance over notes throughout your day. You probably already know more information than you realize. Eat well. Don’t live off of fast food and vending machine snacks. Your body needs balanced meals in order to function appropriately. Your brain needs that nourishment just as much as the rest of your body. Don’t be a loner. Even if you aren’t in the same class, studying with a friend or group of friends can make study time a little easier. If you’re in the same class, you can quiz each other until you both feel comfortable with what you know. Caution: It’s easy to get off track when studying with a friend—especially if you are in different classes. Set rules ahead of time so you both know the intent is strictly to study. Set an alarm every 45 minutes and take a 10-15 minute break to chat and rest your brain. When you answer a card correctly, take it out of the stack and set it aside. Continue going through those you missed until you’re able to take all of them out of the stack. Mix them all up (this makes sure you aren’t memorizing the order). Go over them again doing the same thing. Continue these steps until you’re able to take all (or most) cards out of the stack the first time you go through it. Step away (once you can get through most of the stack on the first try). Watch TV or check your Facebook or something that has nothing to do with school or studying. In other words, let your mind rest for about 30 minutes. After your break, go through these steps again. When you can come back from your break and answer correctly the first time through, then you know your subject! I hope this makes sense, and I hope it helps. Good luck to all of you who are coming up on finals week! The Shocking Truth About a Balanced Life – You Won’t Believe It!